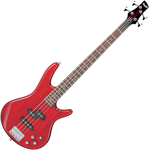 Ibanez GSR200 Electric Bass in Transparent Red [GSR200 TR] - $199.99 : Online Music Store | The Music Store | Mesa, Arizona, All the music you can handle, delivered to your door! Ibanez GSRs offer the famous Soundgear sleekness, comfort, tone, and playability at prices that will astound. Not only do GSR Soundgears look and play better than everything else in their price range, every GSR gets the same warranty, rigorous set-up and inspection of Ibanez’s more expensive models. Phat II active bass boost offers additional low-end power on all GSR200 models. Case sold separately.